rec. live, 4 October 1969, Herkulessal der Residenz (Rondos) and 27 June 1982, Deutsches Museum, Munich, Germany. The heart of this recording descends from a concert at the Munich Klaviersommer Festival on 27th June 1982, at which Friederich Gulda performed alongside Chick Corea. The album "The Meeting" has made the first part of this concert available in the past, but the second part - or at least Gulda's contribution - has never been released until now. The artist to start the ball rolling was chosen at the toss of a coin. Gulda won, and the first Improvisation was his. Commencing explosively, he explores the piano's range and sonorities, introducing fragments of a wide range of stylistic elements, a simple lullaby-like accompaniment gradually emerging and providing a surreal Beethovenesque prologue to Mozart's Sonata in C major, K 330. Composed at a dark period in Mozart's life, Mozart's contradictory cheerfulness is tempered with reserve in Gulda's performance of the first movement. You have the sense of two artists collaborating: Mozart shuffling some sheet music and, placing it in front of the pianist, saying, "here, try this..." There is plenty of Gulda in the playing, and the wonderful central Adagio cantabile is resolutely unsentimental. You have the feeling that Mozart, after hearing it, would have grinned broadly and perhaps have said, "yes - I love your minor key, but how about this..?" 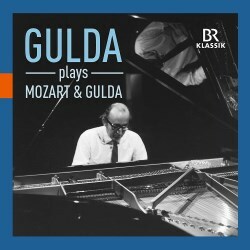 Gulda offers us a moment rather than anything anyone would consider a final thought on this masterpiece, and this is part of the value in this playing, that it makes us reconsider and maybe disagree with Gulda, but at least we're engaged and participating. The final Allegretto has plenty of inner life and an uplifting bounce, Gulda's light touch allowing for plenty of colour and dynamic contrast. The subsequent improvisation interrupts the applause for the sonata, the music staying in Vienna for a time before reaching cinematic grandiloquence, passing through some of the deep and stormy gestures of the first improvisation, to finally burst into a blend of something jazzy that could also as easily be a TV theme tune for some cheesy 1970s detective series. The last two pieces start with the delightfully syncopated counterpoint of No. 1 from Play Piano Play, a kind of "Bach Goes to Town" with plenty of jazz elements and very cleverly constructed, moving into a disarmingly elegant melody that has an improvisatory feel of delivery that fits in well with the surrounding work. The Aria from Gulda's Suite for Piano, E-Piano and Drums is an extravagant favourite which is given what my friend Johan the piano would call "the full Horowitz," with moments of Victor Borge like humour and a feel of breezy brilliance that is hugely entertaining. This pianistic extravaganza is bookended by recordings of Mozart's Rondos, movements now shorn of the piano concertos that they once belonged but, especially in performances like these, filled with the radiance of his finest music. The 1969 recordings come up as freshly as if they were made yesterday. The orchestra is in top form, and Gulda is both respectful and inventive in his shaping and blending of the piano part with the rest of the band in genuinely chamber-music interactions. This is a well-presented addition to our collection of Friederich Gulda recordings, and will of course be a 'must-have' for his fans. There is much beauty here alongside the less conventional playfulness, but the solo performances capture a unique event that stands up even on a recording, lifted from but bringing with it plenty of that live atmosphere. The two Rondos are gorgeous, and I'm sure the whole venture is blessed by the spirit of Mozart.